The Ozone Road jetty at the east end of Ozone Road is aesthetically significant at a LOCAL level. Although rebuilt in c.1952-56 from the original (1911) design, the timber structure with its T plan is an integral visual and physical amenity to the Barwon River bank as part of the eastern-most fringe of Barwon Heads. The Ozone Road jetty at the east end of Ozone Road is historically significant at a LOCAL level. It is associated with the work of the Geelong Harbour Trust, together with the growth of the Barwon Heads township for the need for a second jetty, from 1911. Overall, the Ozone Road jetty at the east end of Ozone Road is of LOCAL significance. 1. 'The Geelong Harbor Trust Commissioners Proposed Plan of Small Boat Jetty, Barwon Heads', 1911, Geelong Historical Records Centre. 2. Geelong Advertiser, 28 February, 1903, 11 December, 1905, 19 December, 1905. 3. Information provided by Warren Chapman from Barwon Coast Management and local resident Dawn Hyland. Photograph dating new jetty in collection held by Martin Klabbers, 2001. The Ozone Road jetty at the east end of Ozone Road is comprised of a T plan. It is constructed of unpainted timber, with piles and decking, and has a simple painted timber balustrade along its length. It forms an integral part of the significant focii situated on the banks of the Barwon River and as a consequence it makes a contribution to the visual amenity of the area within the Flinders precinct. 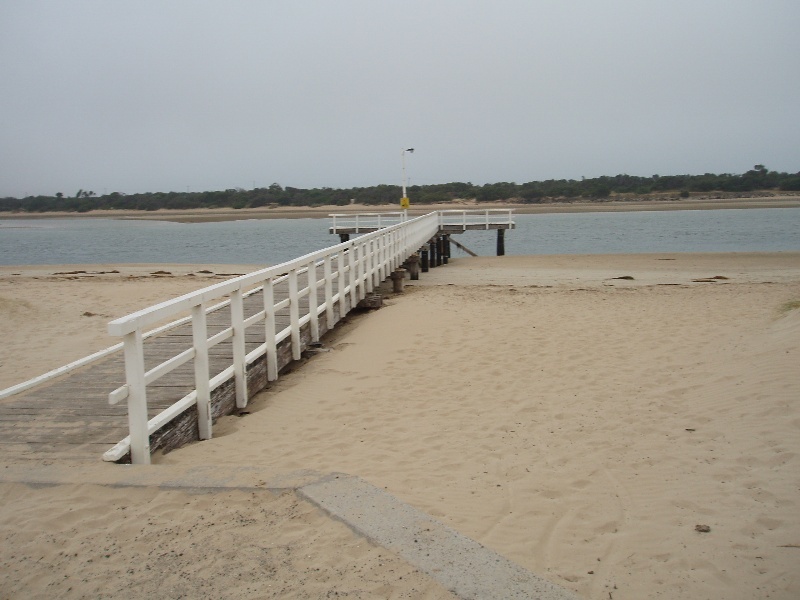 Jetty located near Ozone Road Barwon Heads. A popular haven for recreational fishing and a safe place for swimming, the 'little jetty' (as locals refer to it) has always been a well frequented place to cool off on a hot day.